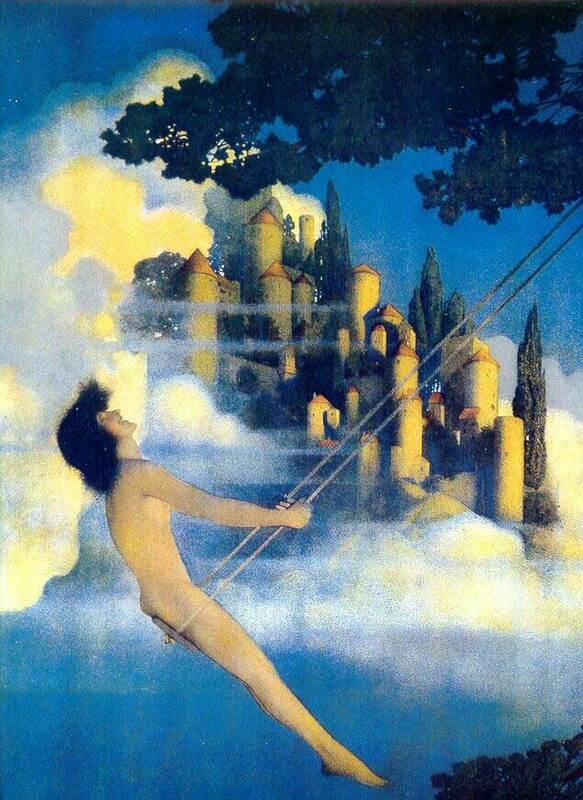 A hundred years ago, one in every four households had a Maxfield Parrish print. He illustrated the classic books, The Arabian Nights, and Poems of Childhood, by Eugene Field, and was the illustrator for Mother Goose in Prose (1897) by Frank L. Baum (who later wrote The Wizard of Oz). Long before Norman Rockwell painted his famous Saturday Evening Post covers, Maxfield Parrish graced the covers of Harper’s Weekly, Life, Colliers, Ladies Home Journal, and numerous other magazines of the early 20th century. At 25, he was already making a living as an artist, and never had to take another job. 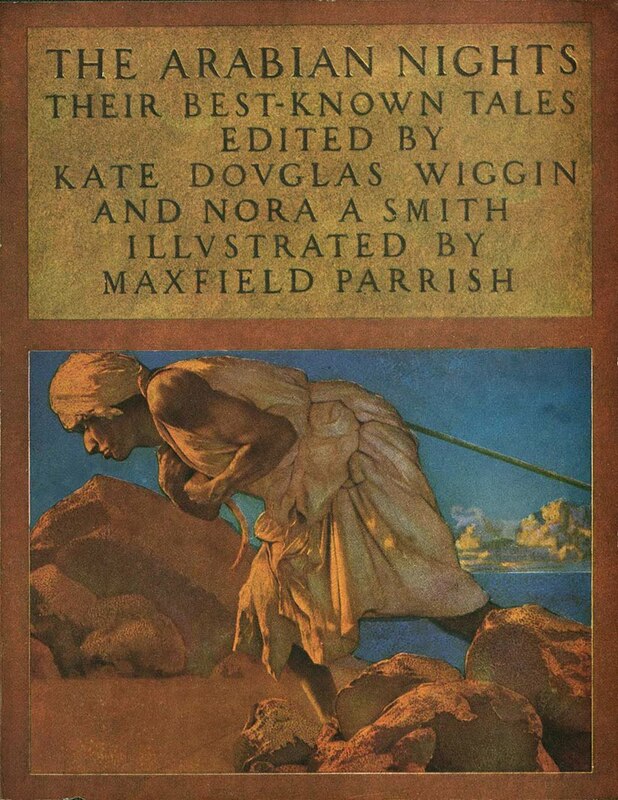 Cover Art for "The Arabian Nights" by Maxfield Parrish (1909). From the start, Maxfield Parrish was a commercial artist. He was able to support a very comfortable existence for himself and his family near Cornish, New Hampshire, a stunning New England village that became home to many artists and writers of the day. He designed and built “the Oaks,” a 20-room house overlooking the Connecticut River and Mount Ascutney in Vermont, and then added a 15-room studio where he could retreat to do his paintings and sketches. There, in the company of his favorite model and lifelong companion, Susan Lewin, a young girl who he first employed as a household assistant to his wife, Lydia, he continued to work daily for another 50 years, mostly on contract or commission. “Dinky Bird” Illustration by Maxfield Parrish from "Poems of Childhood," by Eugene Fields. Born Frederick Parrish in Philadelphia in 1870, the only child of Stephen Parrish and Elizabeth Bancroft Parrish, he was raised in a well-to-do home with many comforts. His father became a well-known etcher in his own right and fully encouraged the young Fred to draw and paint. Frederick later took his grandmother’s maiden name as his middle name, which he used as his professional name from then on. He graduated Haverford College and then attended the Pennsylvania Academy of Art, and the Drexel Institute, where he took classes with Howard Pyle, who recommended him for his first cover commission. At Drexel, he also met a young art instructor, Lydia Austin, who he married in 1895. By 1911, the couple had four children (Dillwyn, Max Jr., Stephen, and Jean). Always keenly aware of the commercial value of his artwork, Parrish entered a new phase of his career in 1935, painting landscapes for the calendar publisher, Brown and Bigelow, which continued until 1962. During those years, they printed more than 50 of his landscapes, although by the 1950s, public interest in his work had seriously waned. His wife, Lydia, died in 1953, and despite having been with Susan Lewin for four decades, he did not marry her. In 1960, at the age of 70, she married a local man she had known since childhood, although she still continued to tend to Parrish, cooking meals and assisting him in his studio. And he enjoyed two periods―book-ending the beginning of his career in the early 1900s through the 20s, and later in the 1960s―when his work was immensely popular, he was often dismissed by critics as a second-rate artist who was mainly an illustrator. He painted his last picture at the age of 91, a landscape called “Getting Away From it All”. At least he got to have the last laugh. In 1964, two years before his death, a retrospective of his work shown at Bennington College in Vermont helped to establish the notion of Parrish as a major contemporary American artist. The show was organized by abstract painter Paul Freeley and then-curator of the Guggenheim Museum, Lawrence Alloway, who felt his work had strongly influenced the emerging “pop art” movement. By all accounts, the best known pop artist of all time, Andy Warhol, had collected many of Parrish’s works. When the show traveled to the Gallery of Modern Art in New York, the ensuring reviews sparked a major revival of interest in Parrish’s work. That same year, the Metropolitan Museum of Art purchased the painting, “The Errant Pan,” signaling his arrival as a major artist. He was 93. His paintings/illustrations were unique in their vision of a highly idealized fantasy world, but one that appealed to the masses. He was and still is associated with a particularly vibrant shade of blue that blanketed the skies of his landscapes, although you will only rarely see a glimpse of that color in reality. And it was not easy for him to render. He devised a laborious technique using base of cobalt blue and white undercoating, which he then glazed with a number of thin alternating coats of oil and varnish. The particular resins he used, called Damar, are known to floresce a shade of yellow-green when exposed to ultraviolet light, giving the unique turquoise hue to the painted sky. The first of his paintings executed specifically for massive reprint was “Daybreak,” in 1922. This painting clearly identified a huge mass market for original art, becoming the most successful art print of the 20th century. Interest spiked again in 1995 when it inspired the setting of Michael Jackson’s attempted romantic video with then wife, Lisa Marie, for the song, “You Are Not Alone.” In 2006, the original painting of Daybreak was sold at auction for a record-setting $7.6 million. This, along with the many books he illustrated and the many prints still available seems to demonstrate the longevity of his art. And now, more than fifty years after his death, I still pause several times a day to stare at the print of “Hilltop Farm, Winter” which I bought from the Boston Museum of Fine Arts (no longer available), and which my sister also owns. And it still brings me great peace and joy when I view it. We all have Parrish to thank for so many peaceful moments from his paintings, and the works of others he inspired. Which brings up the constant dilemma of popular art versus the masters, is it somehow less important to touch many in small ways than to touch few with greatness? This, I believe, can be carried over into your art, and your life. It’s important to say what you can with the means available to you, and at the end of your life, hope that your body of work will amount to something that can honorably reflect who you were. Two of the best books I found on Parrish were Maxfield Parrish by Sylvia Yount (a lovely book to own), and Maxfield Parrish – The Landscapes, by Alma Gilbert, a very enthusiastic lifelong fan of Parrish’s, and the founder of the Parrish Museum in Plainfield, NH. I had always wondered about the two distinct styles of Parrish’s work. I have that one painting of the farmhouse and I love it so much–but I was stunned to see his more commercial prints with their ethereal scenes and women in flowing gowns! The style seemed so different, but it all makes sense now when you say a lot of his work he did on commission to make money. I can surely relate to that as a health writer. Thanks for giving us his bio…it’s nice to know there are second acts in life and success can come late in life. It is interesting how well he seemed to recognize the commercial demands on his art, and how willing he was to give in to them. He did decide later to do what he wanted–the landscapes–and they are really what he is still famous for 45 years after his death. Thanks Linda for supplying the link. I have always enjoyed his work and now its nice to know how he created those amazing blue skies. Edie, Thanks for reading it–and for making a comment. Next blog is on art and making money. I won’t send you all of them, but if you want to sign up, they’ll get sent automatically. Thanks again–and please forward anything of interest onto people you know. That’s how we build a forum! One of my posts on Kenny Loggins is on Digg and I plan to add more. I’m just getting to Stumble Upon now. Thanks! Interestingly enough, I read Maxwell Parrish’s name in Sissy Spacek’s memoir, “My Extraordinary Ordinary Life,” and wanted to know more about the man whose “framed Maxwell Parrish print was hanging on the tree house wall,” of one of the sets for her film, “Badlands,” directed by Terrence Malick. Reading about this amazing artist has been as fascinating and moving as reading about Ms. Spacek, whose lifelong movie career has always intrigued me, both as an avid film buff and, like her, being born and raised in a small Texas town just some 90+ miles from where Sissy grew up in Quitman! Thank you very much for illuminating all of us who ‘find their way to your blog’ on this ‘extraordinary’ man’s lifetime achievements, which evidently still resonate today with many many artists, painters, and regular-folk just like me!!! I was listening to one of my favorite albums, recently released again as a nice remaster (American Football – st). My wife is a lifelong artist and painter, and I often ask her to point me to someone whose works match the music. Even if though she may hear the music differently, she always finds the perfect visual accompaniment. The song playing was The Summer Ends. The picture was a Parrish painting of the children collecting fireflies framed with a female figure inside of what reminds me of a full summer’s moon. The song deals with ambivalence about how someone is going to leave a shaky relationship that he doesn’t have the will to properly cleave. I imagine watching the figures from Parrish’s painting in live motion as the lyrics tie the tenderness of childhood crushes with the heart of an older man who is still just as vulnerable on the inside. I think I may describe it sadder than I can write, but Parrish’s works make me ache. It is the first time after looking at probably 100 or so collections that I can’t stop gazing deep into the background. It immensely helps me and my logical geek brain tie in to the thing my wife loves so much. If you find such an intersection, never let go. I’m not aware of any Parrish painting that fits your description, Jay. Could you possibly post a link to it? Thank you. Lydia and Parrish met at PAFA, not in Pyle’s class at Drexel. This information is based on her diaries at the Rauner collection at Dartmouth. Thanks for the thoughtful article on Maxfield Parrish.